Getting through January is hard enough, so no need to add to it with diets and extreme goal setting in my opinion! Simple changes can make a difference in often subtle ways – boosting our energy levels so we’re more likely to go to the gym or feel more refreshed on waking so we feel happier on those dark grey mornings on our way to work. Here are my 7 easy and sustainable ways to boost your health and happiness this January and beyond….without any sense of deprivation I promise! 1. 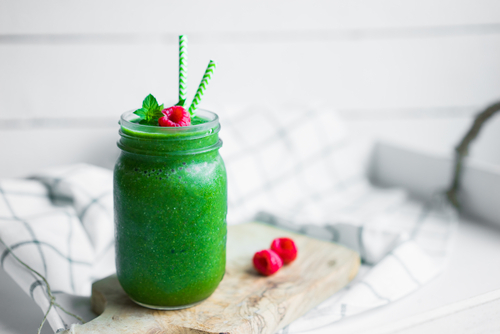 Swap cereal for smoothies at breakfast – a quick and simple way to flood your body with much needed micronutrients that will make you crave them even more…remember the body wants to be well so as soon as it gets a hit of minerals and vitamins in the morning it will want more! 2. Opt for fresh mint or lemon or ginger in hot water instead of that come home from work wine – your liver will thank you for it. 4. Swap meat for oily fish (salmon, trout, mackerel, sardines) – 2-3x a week will help boost your winter skin with essential omega 3 fats. 5. Go gluten free – might sound tricky but so many quality GF options out there. I’m not saying gluten is ‘bad’, it’s just not one of my very ‘helpful’ foods – and is quite often a source of tiredness and bloating in my patients. It also helps you reduce bread, pasta, cakes etc and opt for more nutrient dense alternatives such as courgetti instead of pasta, left overs for lunch rather than sandwiches (tagines, curries, falafel, bean salads) and smoothies or eggs or oat based cereals for breakfast. 6. Swap ready meals for cooking from scratch when eating at home to minimise nutrients being lost through food processing. Always steam your veg too so that you don’t loose precious B vits and vit C in the water. 7. Use butter instead of vegetable oils. Fat has so long been the enemy but it’s vegetable oils that not only increase our intake of omega 6 (which can affect the levels of omega 3 in our body), but also can increase free radials in the body by becoming unstable at high temperatures.